The discovery that this rare frog, living in Borneo, has no lungs, is being used to promote evolution. But as the article shows, this is off the mark. Making headlines is an amazing discovery about a unique species of frog. The amphibian is described as ‘bizarre’, a fitting epithet given that it is missing lungs altogether (the wordplay in the title is intentional).1 The 5 cm (2 inch) long Barbourula kalimantanensis lives in the jungles of Borneo, and apparently gets all the oxygen it needs through its skin. It was first known about some 30 years ago, but being very rare, only one other specimen has been discovered to date, and neither was dissected. Some of the media descriptions associate the frog with the word ‘primitive’, a term loaded with evolutionary connotations. But is it somehow an intermediate, a form closer to some ancestor that had not evolved lungs yet? Not at all; even most informed evolutionists would agree with the conclusion that it is almost certainly descended from a frog that once had lungs. We can ‘connect the dots’ to lead to a very likely scenario of how this species arose. Frogs with lungs already get a significant amount of their oxygen through the skin—this is absorbed directly from the water. Even though its habitat is close to the equator, the streams that B. kalimantanensis lives in are very fast-flowing and extremely cold. Such waters contain large amounts of dissolved oxygen. There is a very similar species of frog in the Philippines that does have lungs, and the two may well be descendants of the same created kind. Without lungs, the body would flatten more readily, increasing the available surface area for skin-breathing still more. Thus, just as in the case of the blind cave fish that have ‘devolved’ from fish with eyes (see this article), natural selection would soon ensure that the entire population was lungless. Such a downhill change would only need a few generations, especially in a small isolated population. No vast time spans are required. Although such fascinating features of the natural world are always trumpeted in evolution-supporting terms, they actually make far more sense in a framework of Genesis history. Vast amounts of information were created in separate biological populations at the beginning, and the direction of biological change since creation has been overwhelmingly downhill—the very opposite of the grand-scale claims of evolution. 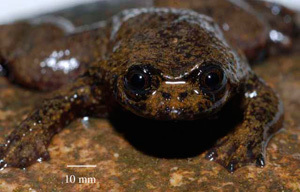 Choi, C, Bizarre Frog has no lungs, http://www.livescience.com/animals/080407-lungless-frog.html, 7 April 2008. Return to text.